I've not been ignoring the Royal Wedding (please pray for them!) or the Beatification of Pope John-Paul II (may he pray for us! ); I have just been very busy and suffering from a really dreadful cold. Before it is too late, I'd like to remind everyone that in the 1962 Calendar St George is celebrated not today but tomorrow - today St Joseph the Workman takes precedence, but St George is too important simply to disapear so he's tomorrow. 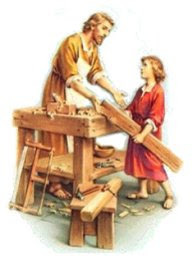 St Joseph himself has been pushed on the 2nd May, from his usual perch on Mayday, by Low Sunday so it's not just me who has been busy! For the first time we are actually celebrating St George in Oxford with a Sung EF Mass: do come along to implore the intercession of England's soldier saint patron. Mass will be at 6pm in SS Gregory & Augustine; there will be polyphony and chant provided by the Schola Abelis.